Hebron, the city of the Biblical patriarchs on the West Bank, plays a major role in the violence that has been plaguing Israel and the Palestinian Territories since late last year. Israeli settlers are talking about bloody terror, the Palestinians about a suffocating occupation. Two irreconcilable narratives from a divided city. Aranoff sighs; her gaze wanders off to the Ariel family home’s garden, on the outskirts of the illegal Israeli settlement of Kiryat Arba, just east of Hebron. She still can’t comprehend how Hallel was killed six days ago. 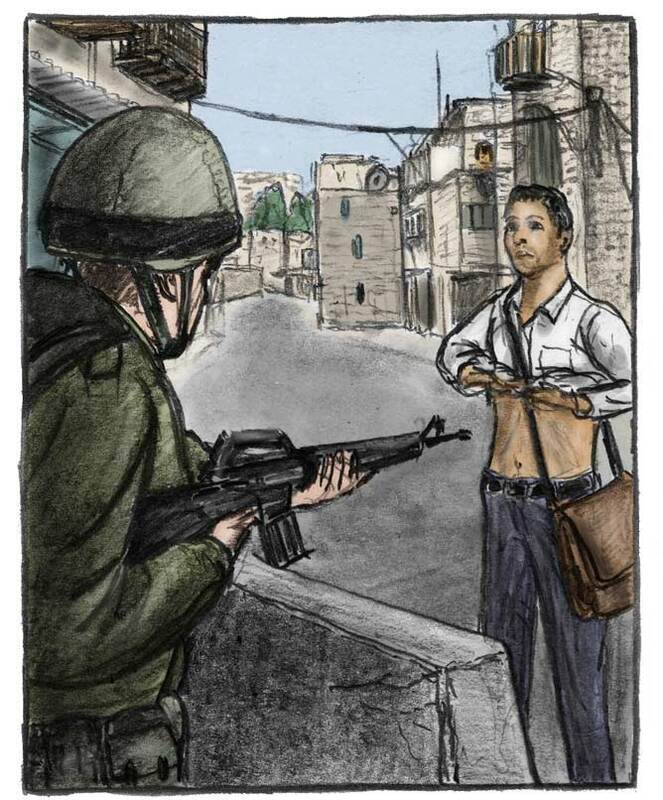 On the morning of June 30, seventeen-year-old Palestinian Muhammad Tarayrah climbed over the fence of the settlement, after which he entered Hallel’s room through a window. He fatally stabbed the sleeping girl several times, before he was shot dead by the hurriedly arrived security guards. A floor tile damaged by a bullet in the bedroom, hung with child’s drawings and school certificates, is now the only remaining trace of the murder. In the living room Hallel’s parents are sitting shiva, the Jewish seven-day mourning period, in the clothes they were wearing at the time of her death, holding back their tears. Tables display food which has been brought along by a seemingly endless stream of visitors: relatives, friends, acquaintances, but also complete strangers from across the country. The killing has deeply touched Israel. Jews and Palestinians lived relatively peacefully together for centuries in Hebron, which houses the tomb where according to tradition Abraham, among others, is buried, the patriarch of both Judaism and Islam. That harmony came to a bloody end in 1929, when 67 Jewish inhabitants were massacred during a Palestinian pogrom. All Jews who survived the massacre fled the city. Fifty years later, however, a group of Jews again settled the Old City, after already having founded Kiryat Arba eleven years earlier. To avoid further bloodshed, Israel closed off parts of the Old City to Palestinians, including the main market along Shuhada Street. In 1997 the city was even divided into two zones. H1, where about 170,000 Palestinians live, comprises eighty percent of Hebron and falls under the control of the Palestinian Authority. H2, under Israeli control, contains most of the Old City and extends eastward to Kiryat Arba, which has about eight thousand inhabitants. In H2, guarded by a large military presence, some 800 Jewish settlers live among more than 30,000 Palestinians, whose every day lives are plagued by checkpoints, fences, concrete barriers and roads that are forbidden to them. Hebron is the only Palestinian city with an Israeli settlement within its borders, which helps te explain why the city is a notorious flashpoint. Not surprisingly, Hebron and its environs also play a major role in the recent wave of violence – which has plagued Israel since late last year and has cost the lives of more than thirty Israelis and two hundred Palestinians. The Israeli army estimates that over eighty attacks have been carried out or planned in the area since October, mostly by Palestinian youths. The violence, which seemed to be declining in recent months, appears to erupt again in this divided city. Therefore, the Israeli government decided in early July to entirely or partially close off Hebron and several surrounding villages to Palestinian traffic. These closures, accompanied by military night raids, have severely limited the freedom of movement of hundreds of thousands of Palestinians and have put a heavy strain on the area’s economy. The measure has been strongly criticized by human rights organizations and the United Nations, who speak about the collective punishment of the Palestinian population. YAS promotes peaceful resistance, such as documenting human rights violations, but is often thwarted by the Israeli authorities. In early November, the Israeli army took over Amro’s house for a day because of ‘security reasons’. “For 28 hours I was held at gunpoint and aggressively questioned in my own living room.” Meanwhile, his media center was being emptied. “The soldiers took everything: computers,cameras, recording devices – worth over fifteen thousand dollars. They even stole my Palestinian flag.” The army still hasn’t told him why this happened, let alone that he has received something back. A stone’s throw away from the office, past a heavily guarded checkpoint, lives Abed Elrahman, a 23-year-old English teacher and one of the few remaining Palestinian residents of Shuhada Street, with his wife, sisters and mother. The call of the Jewish Community to peaceful coexistence he calls disingenuous, pointing to the metal fence that covers his house’s courtyard. Many of his neighbors have constructed similar fencing. The busy souk, which runs parallel to Shuhada Street, is even entirely fenced off from above, in order to prevent settlers from throwing down garbage, rocks and other projectiles. That feeling of suffocation is clearly observable in Bani Naim, a Palestinian village with about 25,000 residents, east of Hebron. After the murder of Hallel Ariel this village, where the perpetrator Muhammad Tarayrah lived, was hermetically sealed by the army. Vehicles are not allowed in or out; access roads are guarded by soldiers or barricaded with heaps of rubble. 2,700 residents have had their travel permits revoked, with which they earned a reasonable salary in Israel. The measures are a heavy blow to the economy of Bani Naim, a for poor village according to Palestinian standards. Israel is punishing an entire village for the actions of an individual, he says. “Nobody here knew what Muhammad had planned and nobody here agrees with his action. Nonetheless, a week ago the army closed off all access roads and limited the supply of electricity, water, food, and other goods, causing the economy to collapse.” To make matters worse, he says, many families in the village were already poor due to the lack of employment.